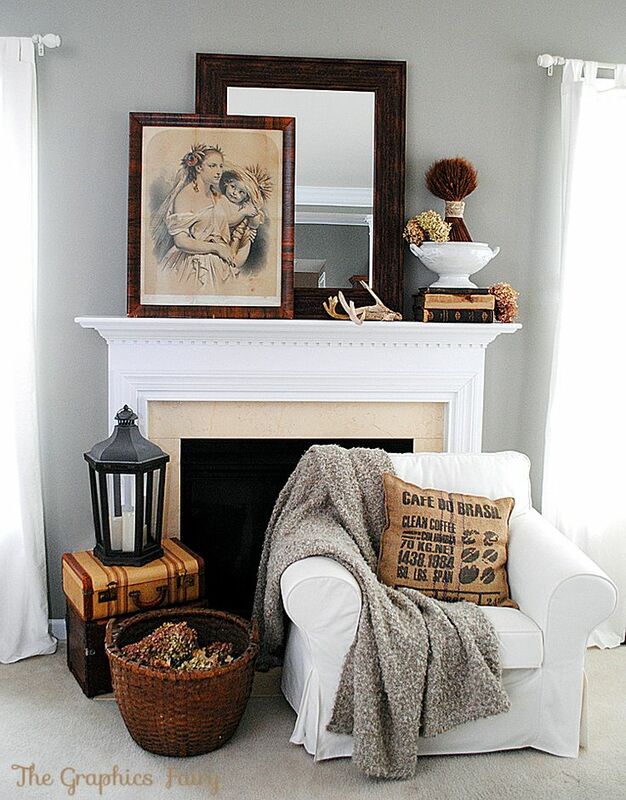 With the season of fall, comes images of fireplaces, blankets and warm fires. So let’s check out three very different fall mantels and I’ll tell you why I fell in love with them. 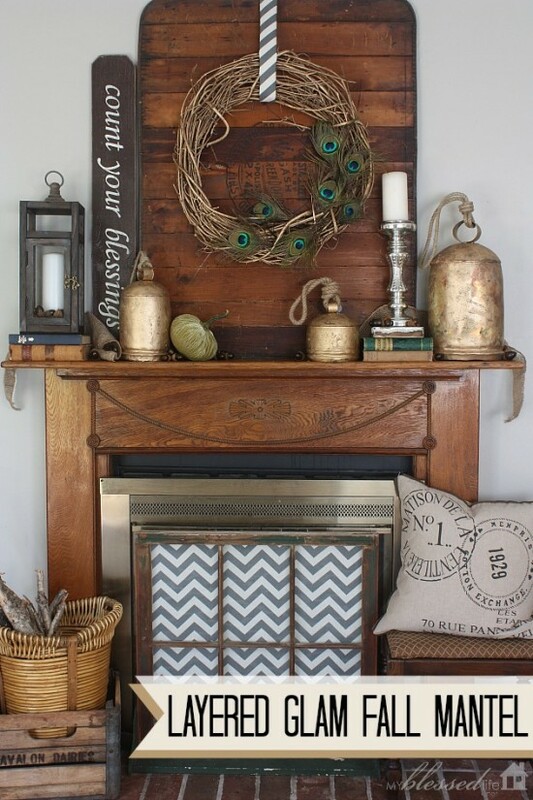 Myra’s amazing fall mantel is stately, and elegant, with the warmth of rustic wood in the mix. 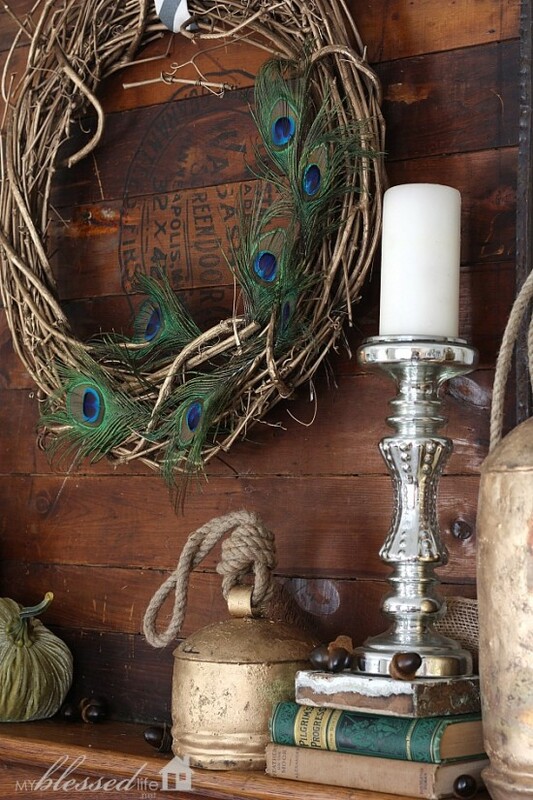 The tarnished gold bells and mercury candlesticks add the perfect amount of downplayed bling. And the softness of the peacock feathers offer rich drama. The overall effect is jaw dropping stunning. The link takes you back to some stellar decorating advise, such as a quick fix to a needed riser. As well as MANY more closeups such as the shot above. Plus. 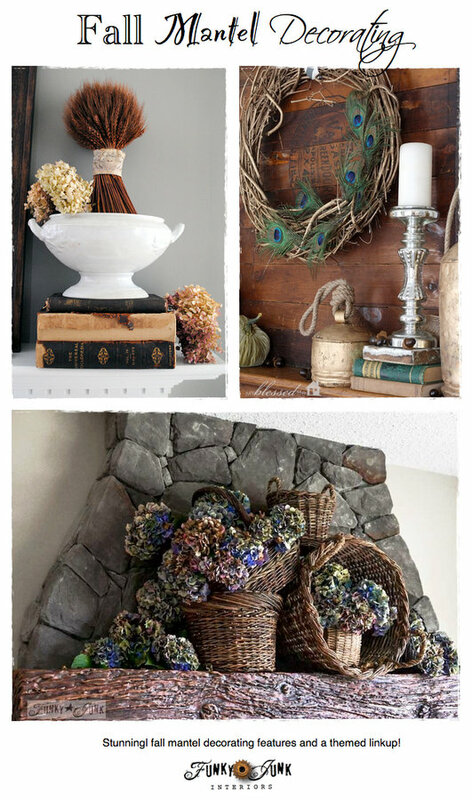 Karen’s vintage inspired fall mantel gives off subtle signals of fall without being obvious, if that makes sense. The layers of accessories draw you in. I adore the simple basket filled with hydrangea blooms layered in front of the trunks. Gorgeous! 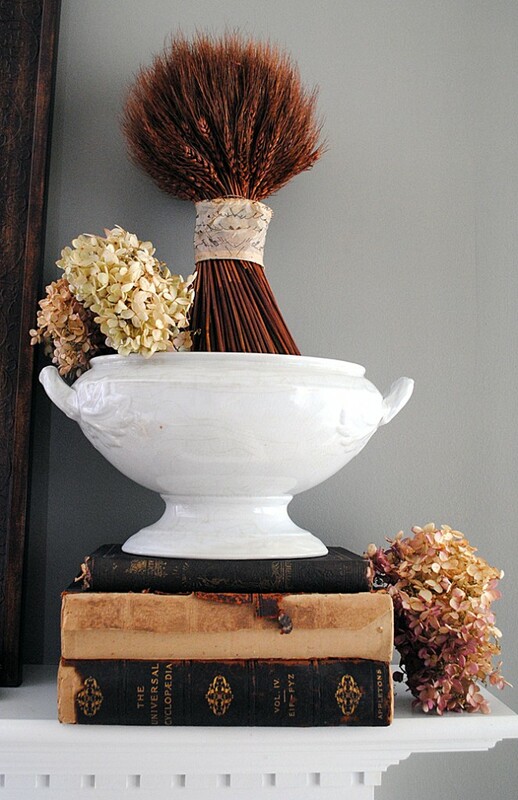 The dazzling cinnamon warmth and shape of the wheat against the antique ironstone tureen is a show stopping stunner. It isn’t often I decorate for fall. I think it’s because our weather ALWAYS feels like fall. 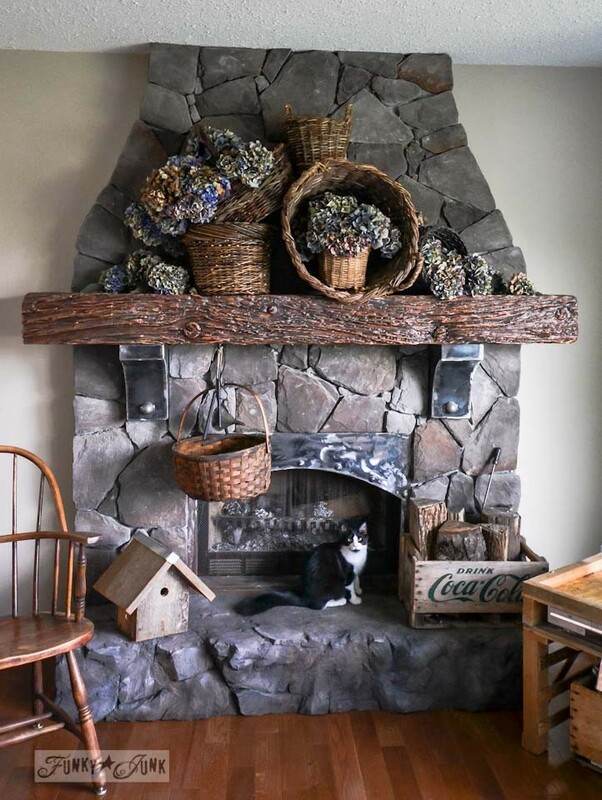 🙂 But the moment I landed some amazing old baskets from my junker brother’s garage sale, I knew immediately my rock fireplace had a new outfit. Have a fall mantel to share? Glad to make it to the party once again. However, I don’t see the DIY Home Projects linkup. Thanks for hosting, Donna! Ooops!! All fixed! I forgot to add the script! Sorry about that. 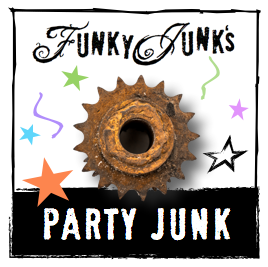 Thanks again Donna for hosting PartyJunk. Love joining in. Your two lovely cats love being in your posts, or is it that we love seeing them, anyway, they are growing so fast and are so beautiful/handsome. And thanks for the great link party every week!! 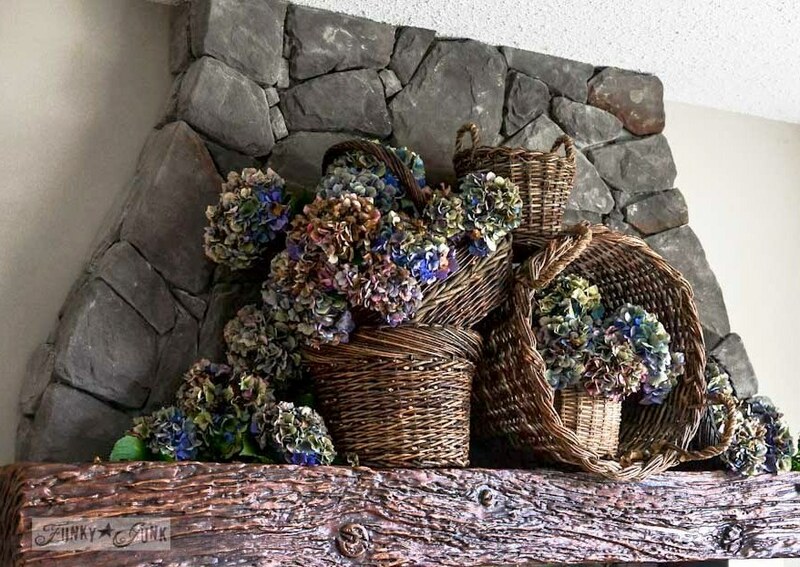 Hi Donna – I love your cascade of baskets with hydrangeas. Beautiful! I also liked your story about the city of Hope. I’ve been through Hope a few times on the way to Kelowna and it hasn’t changed a bit! Thanks for hosting the party again this week. I linked up in the crafts section and last Fall’s mantel. I cannot believe October is here and flying by. I promise to put out fall decor over the weekend. Thank you for a wonderful way to sit back and enjoy other people’s work. I mean, I will be working hard on my fall junk. Thanks for the party, Donna! Thank you so much for hosting Donna!! Hope you have a wonderful weekend!! Thank you for hosting each week. I always like the themes you choose. Tons of great ideas. Thanks so much for a super great party Donna!! All of the features are fabulous. Love this time of year, and everything about Fall. Thank you so much for hosting. Have a great weekend. Thanks for the party Donna. Happy to be sharing my Fall Mantel. I really enjoyed the diversity in the mantles you featured!